Prudent Prana is one of the residential developments of Prudent Infrarealty in Garia Kolkata. It offers spacious 1 BHK, 2 BHK and 3 BHK apartments. The project is well equipped with all the amenities to facilitate the needs of the residents. Garia is located in the south Kolkata. The EM bypass runs through the region. It is surrounded by a lot of hospitals, schools and other civic amenities. It is well connected with various modes of transport. 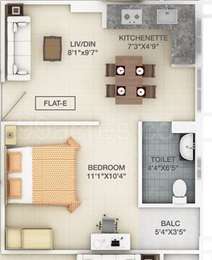 What apartment sizes are available in Prudent Prana? 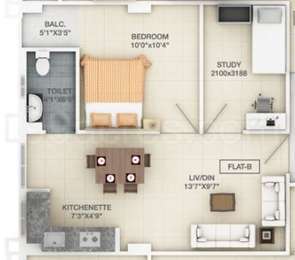 The project offers apartments sized between 468.0 sqft and 1201.0 sqft. What is size of 1 bhk in Prudent Prana? The area of 1 BHK apartments ranges from 468.0 sqft to 627.0 sqft. What is the area of 2 bhk in Prudent Prana? The size of a 2BHK unit in the project ranges from 696.0 sqft to 1074.0 sqft. What is total area of 3 bhk in Prudent Prana? 3 BHK units in the project are available in a size of 966.0 sqft to 1201.0 sqft. What is the area of Prudent Prana?The total area that the project occupies is 4.18 Acres. Prudent Infrarealty is into the realty sector for 30 years now, offering residential and commercial spaces in Kolkata. The group focuses on fair practices and transparency in all its dealings. Working towards developing quality homes, the company takes pride in building relationships with other respected developers as well. Needless to say, the projects developed by them are built with the best raw material and adhere to highest standards of quality. Prudent Prana, Prudent Habitat, Prudent Jaishree are some of its landmarks in the city. Hi Anu, I have checked all the property portals online but cold not find the details of architect So it's better if you personally visit the site and get it confirmed from the sales representative. what is the Booking cost of 2 BHK at G+11Floor, under construction and what is the scheme of EMI? Phone no. **********.